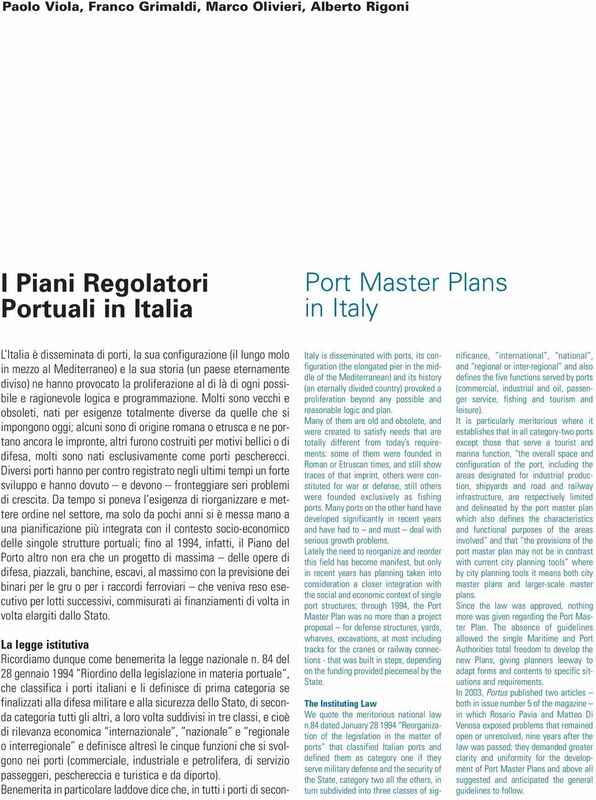 Download "Port Master Plans in Italy. I Piani Regolatori Portuali in Italia. 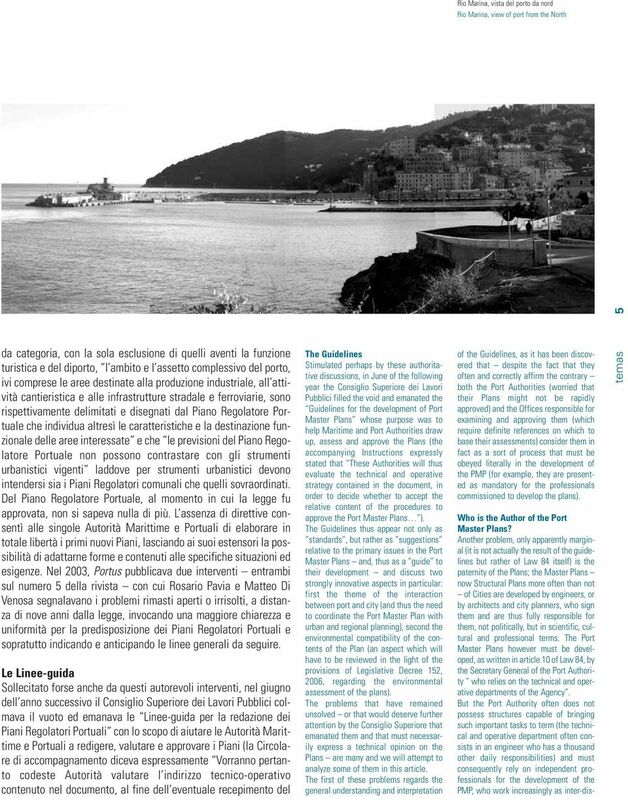 Paolo Viola, Franco Grimaldi, Marco Olivieri, Alberto Rigoni"
1 Paolo Viola, Franco Grimaldi, Marco Olivieri, Alberto Rigoni I Piani Regolatori Portuali in Italia Port Master Plans in Italy L Italia è disseminata di porti, la sua configurazione (il lungo molo in mezzo al Mediterraneo) e la sua storia (un paese eternamente diviso) ne hanno provocato la proliferazione al di là di ogni possibile e ragionevole logica e programmazione. Molti sono vecchi e obsoleti, nati per esigenze totalmente diverse da quelle che si impongono oggi; alcuni sono di origine romana o etrusca e ne portano ancora le impronte, altri furono costruiti per motivi bellici o di difesa, molti sono nati esclusivamente come porti pescherecci. Diversi porti hanno per contro registrato negli ultimi tempi un forte sviluppo e hanno dovuto e devono fronteggiare seri problemi di crescita. Da tempo si poneva l esigenza di riorganizzare e mettere ordine nel settore, ma solo da pochi anni si è messa mano a una pianificazione più integrata con il contesto socio-economico delle singole strutture portuali; fino al 1994, infatti, il Piano del Porto altro non era che un progetto di massima delle opere di difesa, piazzali, banchine, escavi, al massimo con la previsione dei binari per le gru o per i raccordi ferroviari che veniva reso esecutivo per lotti successivi, commisurati ai finanziamenti di volta in volta elargiti dallo Stato. La legge istitutiva Ricordiamo dunque come benemerita la legge nazionale n. 84 del 28 gennaio 1994 Riordino della legislazione in materia portuale, che classifica i porti italiani e li definisce di prima categoria se finalizzati alla difesa militare e alla sicurezza dello Stato, di seconda categoria tutti gli altri, a loro volta suddivisi in tre classi, e cioè di rilevanza economica internazionale, nazionale e regionale o interregionale e definisce altresì le cinque funzioni che si svolgono nei porti (commerciale, industriale e petrolifera, di servizio passeggeri, peschereccia e turistica e da diporto). Benemerita in particolare laddove dice che, in tutti i porti di secon- Italy is disseminated with ports, its configuration (the elongated pier in the middle of the Mediterranean) and its history (an eternally divided country) provoked a proliferation beyond any possible and reasonable logic and plan. Many of them are old and obsolete, and were created to satisfy needs that are totally different from today s requirements: some of them were founded in Roman or Etruscan times, and still show traces of that imprint, others were constituted for war or defense, still others were founded exclusively as fishing ports. Many ports on the other hand have developed significantly in recent years and have had to and must deal with serious growth problems. Lately the need to reorganize and reorder this field has become manifest, but only in recent years has planning taken into consideration a closer integration with the social and economic context of single port structures; through 1994, the Port Master Plan was no more than a project proposal for defense structures, yards, wharves, excavations, at most including tracks for the cranes or railway connections - that was built in steps, depending on the funding provided piecemeal by the State. The Instituting Law We quote the meritorious national law n.84 dated January Reorganization of the legislation in the matter of ports that classified Italian ports and defined them as category one if they serve military defense and the security of the State, category two all the others, in turn subdivided into three classes of significance, international, national, and regional or inter-regional and also defines the five functions served by ports (commercial, industrial and oil, passenger service, fishing and tourism and leisure). It is particularly meritorious where it establishes that in all category-two ports except those that serve a tourist and marina function, the overall space and configuration of the port, including the areas designated for industrial production, shipyards and road and railway infrastructure, are respectively limited and delineated by the port master plan which also defines the characteristics and functional purposes of the areas involved and that the provisions of the port master plan may not be in contrast with current city planning tools where by city planning tools it means both city master plans and larger-scale master plans. Since the law was approved, nothing more was given regarding the Port Master Plan. The absence of guidelines allowed the single Maritime and Port Authorities total freedom to develop the new Plans, giving planners leeway to adapt forms and contents to specific situations and requirements. 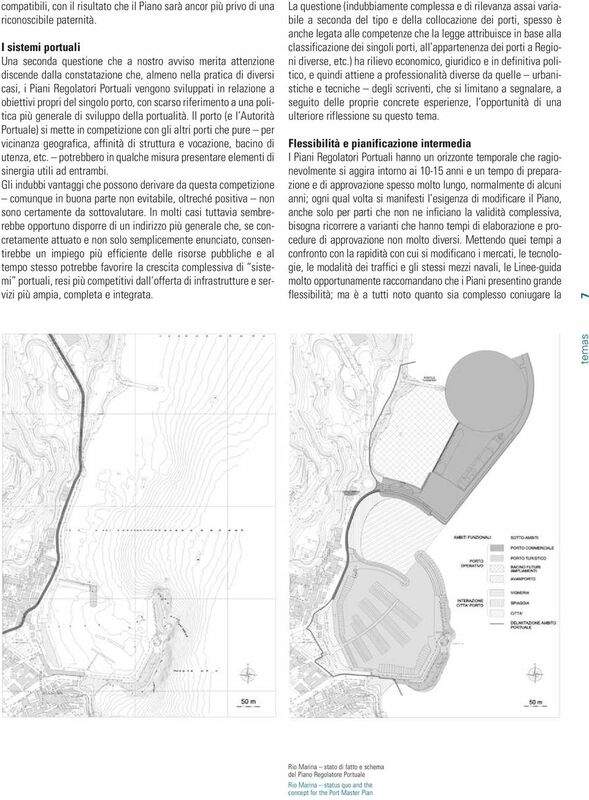 In 2003, Portus published two articles both in issue number 5 of the magazine in which Rosario Pavia and Matteo Di Venosa exposed problems that remained open or unresolved, nine years after the law was passed; they demanded greater clarity and uniformity for the development of Port Master Plans and above all suggested and anticipated the general guidelines to follow. 5 topics 8 flessibilità del Piano con le pur necessarie garanzie e cautele verso gli interventi attraverso i quali esso si attuerà. 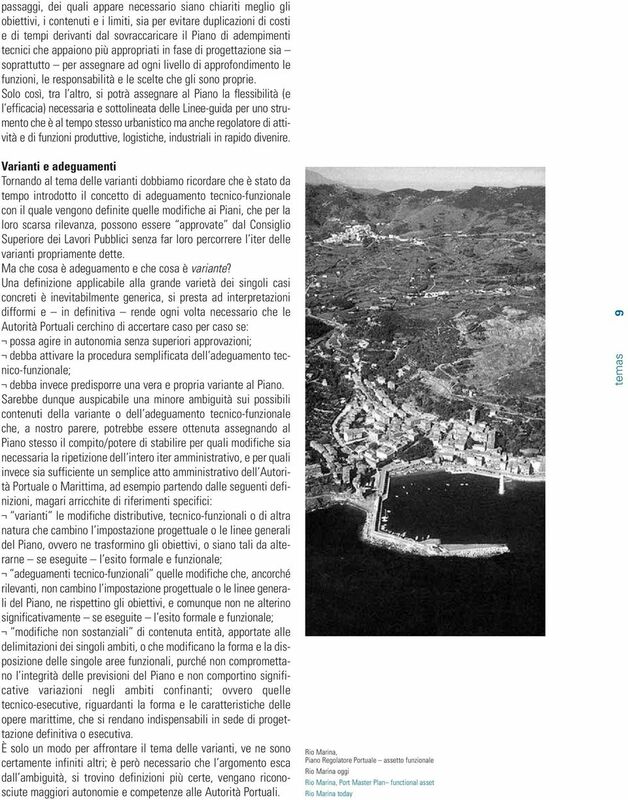 In urbanistica questo genere di problemi è stato risolto con la pianificazione intermedia (piani particolareggiati, di lottizzazione, di settore, di ambito, ecc.) e, più recentemente, con procedure di concertazione (piani integrati di intervento, accordi di programma, piani di recupero, ecc.) ancora più snelle e quindi in grado di rispondere meglio al mutare delle condizioni al contorno. Nella pianificazione portuale non esistono indicazioni per accogliere questi processi di approfondimento e concertazione, che risulterebbero particolarmente utili nel sotto-ambito di interazione città-porto, salvo attribuire ai Piani Operativi Triennali compiti che loro non competono essendo preordinati a definire solo le strategie di sviluppo delle attività portuali e gli interventi volti a garantire il rispetto degli obiettivi prefissati. Le Linee-guida peraltro introducono l opportunità di individuare nel PRP aree oggetto di operazioni attuative unitarie. Potrebbe quindi risultare utile definire più completamente uno strumento Piano Operativo di Settore o Piano di Inquadramento Operativo che rappresenti un passo intermedio tra il Piano Regolatore e il successivo progetto delle opere, che permetta al Piano di svolgere la sua vera funzione strategica o strutturale rimandando al livello più dettagliato la definizione degli aspetti più esplicitamente funzionali o più specifici per i diversi ambiti. 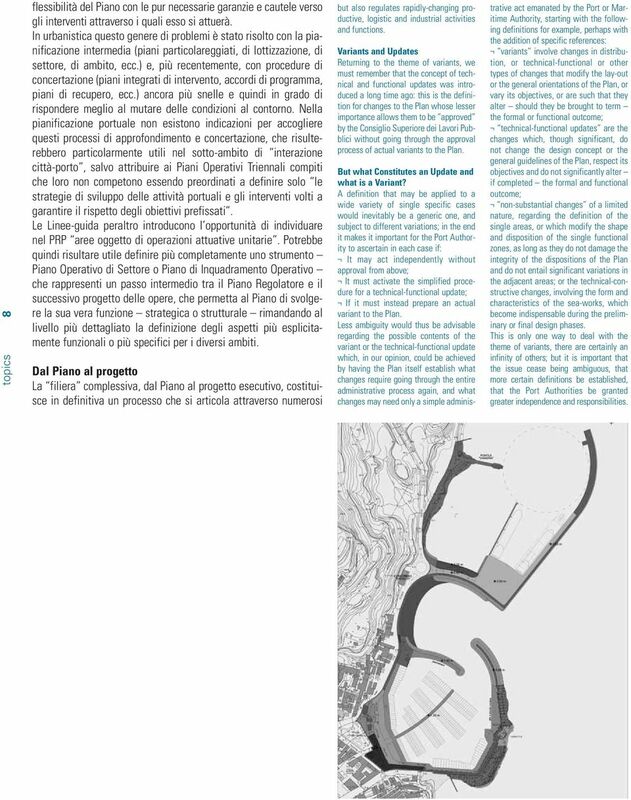 Dal Piano al progetto La filiera complessiva, dal Piano al progetto esecutivo, costituisce in definitiva un processo che si articola attraverso numerosi but also regulates rapidly-changing productive, logistic and industrial activities and functions. Variants and Updates Returning to the theme of variants, we must remember that the concept of technical and functional updates was introduced a long time ago: this is the definition for changes to the Plan whose lesser importance allows them to be approved by the Consiglio Superiore dei Lavori Pubblici without going through the approval process of actual variants to the Plan. But what Constitutes an Update and what is a Variant? A definition that may be applied to a wide variety of single specific cases would inevitably be a generic one, and subject to different variations; in the end it makes it important for the Port Authority to ascertain in each case if: It may act independently without approval from above; It must activate the simplified procedure for a technical-functional update; If it must instead prepare an actual variant to the Plan. Less ambiguity would thus be advisable regarding the possible contents of the variant or the technical-functional update which, in our opinion, could be achieved by having the Plan itself establish what changes require going through the entire administrative process again, and what changes may need only a simple administrative act emanated by the Port or Maritime Authority, starting with the following definitions for example, perhaps with the addition of specific references: variants involve changes in distribution, or technical-functional or other types of changes that modify the lay-out or the general orientations of the Plan, or vary its objectives, or are such that they alter should they be brought to term the formal or functional outcome; technical-functional updates are the changes which, though significant, do not change the design concept or the general guidelines of the Plan, respect its objectives and do not significantly alter if completed the formal and functional outcome; non-substantial changes of a limited nature, regarding the definition of the single areas, or which modify the shape and disposition of the single functional zones, as long as they do not damage the integrity of the dispositions of the Plan and do not entail significant variations in the adjacent areas; or the technical-constructive changes, involving the form and characteristics of the sea-works, which become indispensable during the preliminary or final design phases. This is only one way to deal with the theme of variants, there are certainly an infinity of others; but it is important that the issue cease being ambiguous, that more certain definitions be established, that the Port Authorities be granted greater independence and responsibilities. Copyright 2012 Binary System srl 29122 Piacenza ITALIA Via Coppalati, 6 P.IVA 01614510335 - info@binarysystem.eu http://www.binarysystem. TAVOLO DEGLI ENTI LOCALI PER IL CLIMA 22 novembre VERSO LA STRATEGIA NAZIONALE DI ADATTAMENTO Responsabilità di Governo e competenze dei territori Sala Palazzo Bologna Senato della Repubblica Via di S.
Liberi di... Immediately takes care of the client, creating a special feeling since the first meeting aimed to investigate the customer needs. L AoS avrà validità per l intero periodo anche in caso di interruzione del rapporto tra l'assurer e l assuree. REGIONE EMILIA-ROMAGNA IX LEGISLATURA ASSEMBLEA LEGISLATIVA OGGETTO: 2949 I COMMISSIONE PERMANENTE "BILANCIO AFFARI GENERALI ED ISTITUZIONALI"
CI PRENDIAMO C URA DEI TUOI SOGNI.